Graphite hot zone and graphite heating elements. 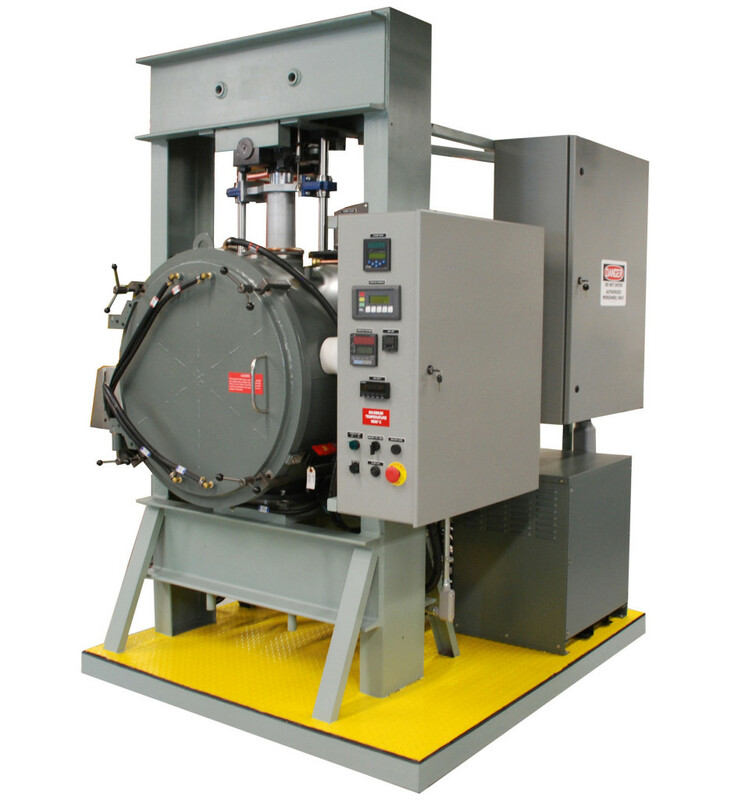 This unit can operate as either a vacuum hot press or a high temperature vacuum furnace. Removing the die pieces inside will allow the unit to operate as a conventional vacuum furnace. High vacuum operation. Includes 4” diffusion pump, high vacuum valve, foreline valve, digital high vacuum gauge, and necessary wiring to accommodate high vacuum operation. Fully automatic operation with new, improved PLC programmer/controller with alphanumeric display to indicate furnace processing cycles. Programmable closed-loop pressure control. This includes the necessary modifications to the hydraulic system to enable its operation to be programmable as opposed to manual. This system will consist of a Yokogawa UP750 two-loop programmable temperature controller with 300 programs and 3,000 segments. The UP750 will control the pressure on the hydraulic ram on the same timeline. Programming of pressure, as well as temperature, could then be accomplished. Bubbler to eliminate partial pressure back streaming during the atmosphere operation.